Friday - today - today is Friday. I don't know where the week has gone too! And it is now midday Friday to boot! Time has started to escape me and I don't know when it happened. Well, actually right around the time I turned 40, I think! Seriously, what happens to our brains now? 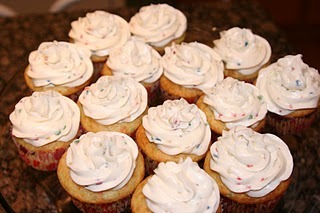 Like these that I baked last night! In all seriousness, I used to be quite proud of my time management skills and the fact that I could multitask better than anyone I knew. I was beyond efficient in the work force. Now, I can barely handle getting a shower in each day (yes, I did shower this morning), get 3 children out the door and 2 off to school - ON TIME - with food in their bellies (this is most always done while in the car). All this while taking care of a baby, whom I still nurse and who just started to walk on her own not too long ago. I wish my brain would return, Perhaps next Friday? ?